I graduated with an upper 2:1 in Ceramics from Bath Spa University in 2009 and was one of 17 crafts people selected by the Crafts Council in 2010 for the ‘Hot House’ initiative; a 6 month programme of mentoring and business skills funded by the Crafts Council. My work is heavily influenced by the ‘aged’ and ‘distressed beauty’ of Miss Haversham’s Wedding Table in Dickens Great Expectations and the darker, more curious side of Victorian life. A love of Theatre and Victorian Gothic combined with a life spent exercising a vivid imagination encourage the particularly British peculiarity of my ceramics. A personal obsession with scouring junk shops for objects to engage with acts as a stimulus for me, instigating my employment of reclaimed possessions as both inspiration and adornment. Using tea spoons as handles has become a familiar theme in my work. I revisit the memories and emotions associated with vintage ceramics, press moulding the smaller pieces directly from Victorian tableware, each piece is fired 5 times to achieve its distinctive patina using a collage of textural surfaces, slips, glazes, transfers and lustre’s. The larger pieces are my ‘drawings in clay’, slab built recreations of my drawings, heavily textured and spontaneous. 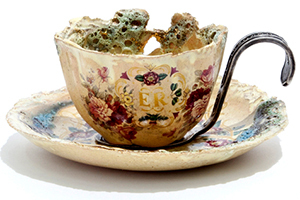 My work is highly ornate and is adorned with printing and an array of visual ephemera, each piece I have created is a spontaneous response to the reworking of ‘precious’ objects resulting in a sensory banquet. My work has been exhibited in London, New York and Geneva.